Clemson is a worthy opponent for Alabama in the National Title game. They are solid in each facet of the game and can make some explosive plays. But versus Alabama, the game will be won or lost in the trenches. Alabama is a physical football team and they have dominated teams up front for majority of the season. Clemson is a physical bunch as well and they will not wilt when facing the Crimson Tide. But eventually the physical play and the explosiveness of the Alabama front seven will get to the Tigers. The Warriors are again having a great season. And of course they will be a factor in the West this year. But let’s not forget that there are some other teams that can get it going and potentially knock them off. Teams like the Oklahoma City Thunder and the San Antonio Spurs are talented enough to give the Warriors fits. And this season, one of those teams jumps up and gets the job done, ending the Warriors’ season prematurely. All three teams are very deep and talented. But in this year’s college basketball, each team has some flaws going with them. Of course North Carolina is the most talented of them all and they are shooting the basketball well this year. But eventually the shooting will fall back to earth and they will have to win a game with defense. That will be where they fall. As far as Kentucky, they have been pushed around more in the post than usual. And even though they are talented, that shortcoming will leave them hamstrung in March. And as far as Duke, they may have their tough guy, forward Amile Jefferson, back before the season is over. But they still don’t have enough scoring from inside that will scare someone. And that will be something that eventually catches up to them. This past year, the Cubs went further than anyone thought they would. And heading into this season, the expectations are they will go even further. Some may wilt under those type of goals, but this team may just thrive under them. And with the additions they have made this offseason, the Cubs will finally make it back to the World Series and will win one, breaking the supposed curse that was placed upon them. Quarterback Cam Newton and the Carolina Panthers are sitting on top of the football world right now, sporting the best record in the NFL at 14-1. But that is not the ultimate goal for them. The thing that they are striving to get is the Lombardi Trophy. And for the Panthers, plenty keep speaking on all the reasons this team cannot win the Lombardi Trophy. Well, Cam and the boys have been listening and they will use that as extra motivation to go to the first Super Bowl for Carolina since 2003. And instead of coming up short like they did against the Patriots the last time they were there, the Panthers will seize the day and win their first Lombardi Trophy. Curry was in another world last year. He averaged 24 points per game and eight assists last season while locking up the MVP trophy. And just when it was thought he could not get any better, he shows up this season and is putting up better shooting, scoring and rebounding numbers across the board. He has gone from another world to another stratosphere and there is no doubting that he is the best player in the NBA right now. And with the record the Warriors are currently sporting, he will be the MVP again. As much as some want to give this award to LeBron, it just will not happen again. The talk around Philly is they are in tank mode once again. And the object of their affection this year seems to be LSU forward Ben Simmons. The Australian forward can do everything on the floor and that combination of size and skill has every NFL scout hoping Christmas comes in June for them. It would seem the perfect storm would have Philly getting the first overall pick this year in the draft. But unfortunately, it will not be for them this year either. The 76ers will get the second or third pick, not the first. And with that, they can kiss goodbye to Ben Simmons ever wearing a Philadelphia uniform. Head coach Gus Bradley is building something in Jacksonville. He has a quarterback in place in Blake Bortles, a reliable tight end in Julius Thomas, two young receivers that are making it happen in Allen Hurns and Allen Robinson and running back TJ Yeldon. Defensively, the Jags have taken a step forward this year and will more than likely add a pass rusher next season. That combination of things along with the state of the AFC South could have them either winning the division or making the playoffs as a wildcard. The team showed growth this season. Derek Carr showed even more improvement this season. And with the weapons he has offensively, the offense should do nothing but get better next season. And defensively, they have a standout player in Khalil Mack. If they are able to add more defensive backfield help, this team will definitely be ready to make the playoffs next year. The Silver and Black will be back next year. DeMarcus is a very talented player. Unfortunately, he has not been able to wrangle his temper on the court. And with the surroundings in the city of Sacramento, it may not be the place for him to have success and mature as a player. 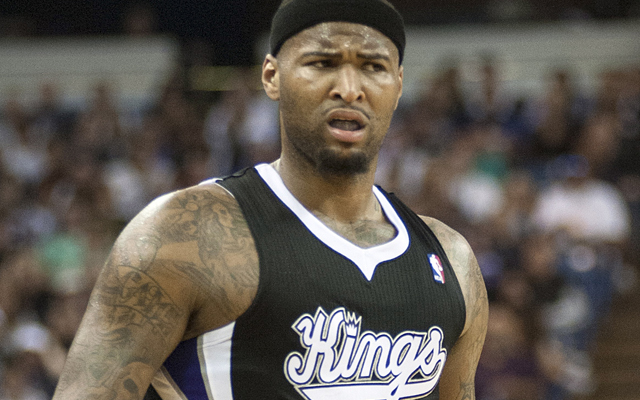 So with that being said, Cousins will be out of Sacramento this offseason. Boston would be one place that has assets to trade for him. But there will be plenty that will be vying for his services. Only time will tell, but he will be playing in another city come next basketball season. Much has been said of where Durant will land next year. There have been rumors floated out there of him landing in everywhere from Golden State to Washington next year. But in the end, the prevailing thought is he will end up staying in Oklahoma City. The chemistry he and Westbrook have is something that he will not find anywhere else. And if they can get some consistent scoring from a third option, then this team will be able to make that magical run like they did when they met LeBron’s Miami team in the NBA Finals. Peyton Manning will not retire. It was looking like he would be done at the end of the season last year. But instead of doing so, he decided to come back this season. Needless to say, this has not been the most memorable of seasons for him as a starter this year. And despite the thoughts that he will be retiring at the end of the season (and by looking at him right now, he should), he will more than likely try to play yet another season in the NFL. The question now is where he will play because it surely won’t be in Denver next year. Both have been excellent coordinators and Jackson never really got a shot when he was in Oakland. Jackson has been very solid as the offensive coordinator in Cincinnati and Austin has been excellent as the defensive coordinator in Detroit. Both are definitely qualified and you are hearing their names mentioned over and over again in coaching searches. It will only be a matter of time before both become head coaches. And this offseason is the perfect time for both to become head coaches in the NFL. 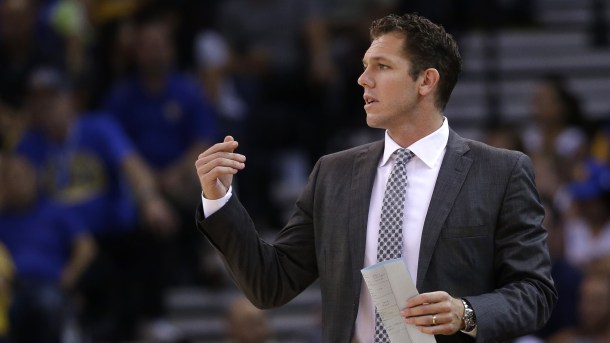 Unexpectedly, Luke Walton has been the interim head coach of the Golden State Warriors. Some may have expected the Warriors to not do so well without their leader, but Walton has led the team very well in his absence. And he has done so well that he will garner some head coaching looks around the NBA. One place that will be looking for a head coach soon will be the Los Angeles Lakers. With his experience with the organization as a player and his familiarity with the team, he would be a perfect fit for them and their young team. I know this is something that Kansas City fans will not want to hear, but it could definitely happen. The Royals just won the title, so there is always that moment of relaxation knowing you have achieved your goal. And the Royals will be fighting that all season long as they try to repeat as champions. Unfortunately, they will not be able to overcome that as they miss the playoffs this upcoming season. As time has gone on, keyboard courage has grown more and more amongst fans of sports. You can see on social media all the people that continue to call people out knowing they will never meet them in real life. Unfortunately, this is not going anywhere and there will be more of it to come. A thing I have proposed is that things would change if people had to attach their employer to the things that they say. I bet the fear of losing their job would change the things that people say. The new year brings some new things and also some new happenings as well. It will be interesting to see if these sixteen things happen or if these thoughts going flying in the wind. The Golden State Warriors have reached rock star status in the NBA. Everywhere they go, the crowds gather early to see Steph Curry warm up. And to greet them in every arena, there are packed houses of those that come to the arena hoping their team ends the streak the Warriors. Boston was the most recent to try and knock them off. The game went into double-overtime. And even without two starters (small forward Harrison Barnes and shooting guard Klay Thompson), the Warriors were able to pull it out. The 24-0 start Golden State is out to this season is incredible. They approach the game with a passion and play with an ease. Their movements are almost poetic as they singe the nets with their shooting. And on the defensive end, they may not be as potent as they were last season, but they have made stops when they need to in order to preserve their record. The biggest thing to come out of all this is they are doing this without their head coach. Steven Kerr had offseason back surgery and has had complications recovering. The result has been assistant coach Luke Walton stepping in to guide the team. And even though some may have expected a hiccup, the beat has gone on. Walton was not expected to be as good of a placeholder as he has been. Many expected mistakes to be made when it came to crunch time and crunch situations. But instead of crumbling under the pressure, Walton has made the correct calls in terms of pushing the right buttons. Some speak of these calls and things being something Kerr is orchestrating instead of Walton, but that is not the case. Of course Walton and Kerr talk daily, but it is Walton’s call on the court. And because of the success he has had so far leading the Warriors, his name is starting to get some buzz around the league. Walton definitely has the cool of his former Lakers head coach Phil Jackson on the sideline. That demeanor serves this team well as Walton never exhibits panic at all. Even when the Warriors have been down in games, the same expression lays on his far, believing in his team. And his belief has been justified with the unblemished record this season. There are a few places in the NBA that will be looking for a new head coach. And as the season goes on and Kerr returns, Walton will return to his assistant role. But even though he will return to that role, it will be hard for him to take that step back again. And he eventually will want to run his own organization soon rather than later. If Walton’s star is on the rise, this season should be his last in Oakland. He may love the success of the team, but he will want to move forward and be the head man. As far as options for Walton, there is one option that stands above them all. The veteran NBA player and current assistant coach played for most of his career in Los Angeles for the Lakers. And that could be a spot that opens up sooner rather than later. 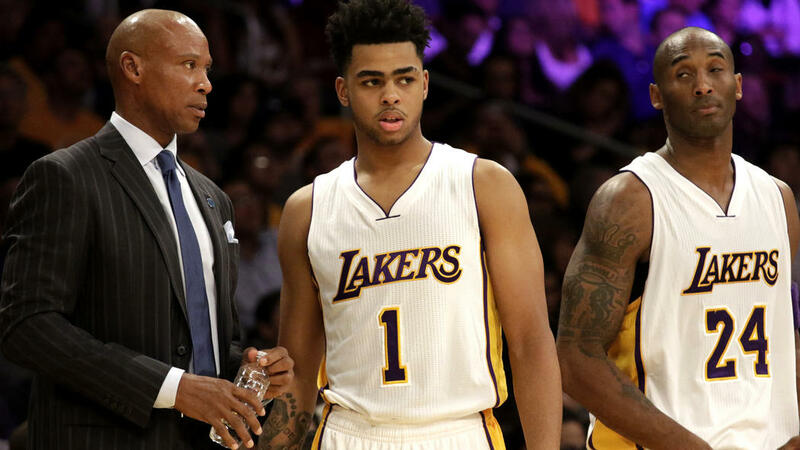 The Lakers are still trying to find themselves and Byron Scott is not the most patient in teaching young players. Between the inconsistent minutes for young players D’Angelo Russell and Julius Randle, the mismanagement of Kobe’s minutes and the misuse of backup big man Brandon Bass, it seems that Scott just cannot put the pieces together. And instead of letting him go, the Lakers continue to hand on to him. But if they can get Walton to come, they can start building a sturdy foundation after Kobe retires. That would include finding the best way for Russell, Randle and guard Jordan Clarkson to co-exist on the floor seamlessly. And with him having the pedigree of being a player and coach on championship squads, Walton could bring a winning culture to the Lakers. Of course Walton isn’t the only change that needs to happen at that time for some (there are some calls for management changes as well). But he is a step in the right direction towards helping make them relevant again. The timer has already expired for Byron Scott. The team has seemingly not improved. The only building block that people know anything about right now is Jordan Clarkson. And with Kobe Bryant stepping aside after this season, the timing is perfect to replace Byron Scott. And with his Lakers pedigree, the skills he is showing on the sideline, and the potential lure of coming back where it all started, Walton could be coming back to help his former team rise again. For now he is the interim head coach for the Warriors. But soon enough someone will give him a chance. And that someone will be the Los Angeles Lakers. The Los Angeles Lakers have been one of the most storied franchises in professional sports history. From Jerry West to Kobe Bryant, the Lakers have always had star power along with the championship mettle. Thinking of all that history makes it hard to believe the Lakers have been relegated to what they currently are now. After their loss to the Golden State Warriors Tuesday, the Lakers are now sporting a record of 2-12. The team, which former Laker Byron Scott coaches, has stumbled out of the blocks yet again. And the worst part is there is no telling when they will stumble out of the darkness and back into the limelight. Under Scott, the Lakers have not made the playoffs nor have they looked close to making it. For a franchise that has been used to success, this is something that has to be troublesome for the team and their fans. After reviewing the game against the Warriors, there were a few things that struck me as interesting for a team that is constructed the way they are. It just seems like they are out of sync. They are a young team and they are not expected to make the playoffs, but some of the things they are doing is not making them any better on the court. With a few adjustments, the team could actually be a better product to watch and be more competitive on the court. The offensive philosophy of this team seems very simple. It seems like they run the offense through Kobe Bryant still. In case Byron Scott has not been watching, Kobe is not the same Kobe he once was. For example, he went 1-14 against the Warriors and did not seem to have the same lift he once had. But Scott seems determined to run the offense through Bryant no matter what. One day he may want to realize that Bryant is not the future of this team. The future of the team lies in D’Angelo Russell, Jordan Clarkson and power forward Julius Randle. These three young guys have a chance to be the future of the franchise and lead them back to relevance. But as long as the offense is run through Kobe, there is no room for them to grow. And as time goes on, these young players need time to mature and minutes to grow. The more they are put in situations where they have to lead and be the playmaker, the more you find out what you do or don’t have in them. You also find out what you need to surround them with. And once you are able to get a true evaluation of their skills, then you can start moving forward with more information and things to build on. The adjustment in the offensive philosophy not only has to do with the change of the focus but the change of pace as well. Byron Scott is trying to run a Princeton-style offense with the young players that he has. If you are not aware of what kind of offense this is, it is predicated on movement and a series of cuts and off-the-ball movement. For a team that has veteran players that are in the NBA it takes time to learn. So imagine what it is doing to the youngsters playing with the Lakers. D’Angelo Russell looks tentative on the court at all times. It seems like he is thinking more than playing. Clarkson will be fine, but he even has moments where he does not get what’s going on too. And as far as Randle, he is a guy they want to take a rebound and push the basketball. But it seems like they are not really pushing the fact that they want him to push the basketball. The slower pace for the Lakers helps guys like Kobe and center Roy Hibbert but hurts the young guns. Since Hibbert and Kobe are not giving them much, why are they catering to these two? Why not get the most out of your young and entertaining pieces by pushing the basketball? And if Hibbert or Kobe cannot keep up, cut down their minutes and play more young guys that can pick up the slack. If that can happen, I can guarantee the Lakers would see more out of Russell than they currently are. They would also see Clarkson and Randle be better. The Lakers do have some talented scorers off their bench in Nick Young and Lou Williams. The former 6th man of the Year with the Raptors last season, Williams came to LA this offseason to play for the Lakers. It was thought he would bring some firepower off their bench, but it has not worked out the way he has thought. His average is down three points from 15 points per game to 12 points per game. And when you watch the games, Byron Scott has him playing point guard. Lou Williams may not be the prototypical size for a shooting guard, but that is what he does and has done his whole career. Having him initiate the offense is not a good look at all. The best thing to do for him is put either Clarkson or Russell on the point and allow him to create as a scorer when Kobe goes to the bench. In doing that, you will get the best use out of Williams that can help this team. And if you combine the faster tempo with this move, then you get Lou Williams going in the right direction. The Lakers could be better than what they currently are. But instead of being a team that is getting their young pups ready to take over, they are still letting the old guard run this team. Kobe is one of the greatest players of all-time, but his time has passed and he is holding back these youngsters. And if Byron Scott does not understand that, then maybe it is time for him to call it a career with the Lakers. The team has pieces to grow with, but Byron is not helping the situation at all. If these adjustments were made at least on the offensive end, the Lakers would be growing instead of looking like a team with no direction. The NBA basketball season is right around the corner. Teams are full with expectations and some with reservations. And while teams are looking to make it happen, there are players that are either looking forward to free agency or trying to change their narrative. One player that is being talked about regularly for next summer is Oklahoma City small forward Kevin Durant. Along with everyone wondering how his health will hold up, there are some wondering if he will be in Oklahoma City next season. He has yet to sign an extension and there are some that think he will be leaving for another scene in 2016. Recently, ESPN’s Stephen A. Smith fueled those flames by saying he had heard from sources that Durant would definitely be considering the Los Angeles Lakers as his primary target should he not return to the Oklahoma City Thunder. 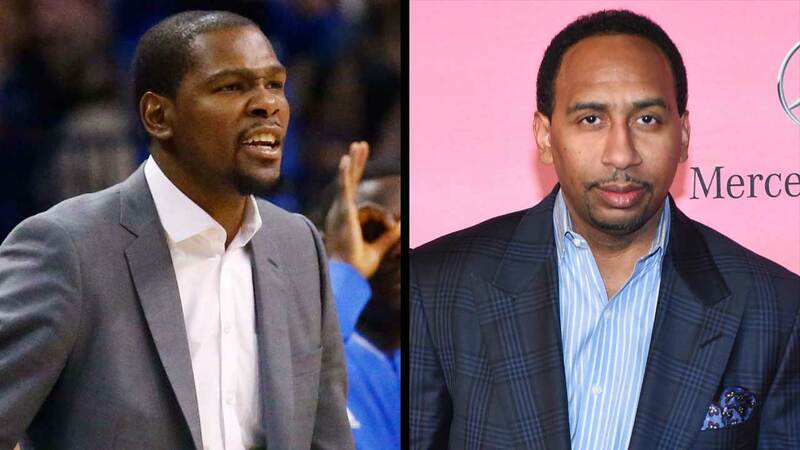 And when Durant heard this, he had this to say: “I don’t talk to Stephen A. Smith at all. Nobody in my family, my friends, they don’t talk to Stephen A. Smith. So he’s lying.” Of course this response struck a chord with Smith and he addressed Durant on Monday’s edition of First Take. He proceeded to break down everything Durant said and claimed that Durant was the one “lying” and that he indeed talked to someone close to him. Smith also said Durant may want to check his sources. He even went as far as to say he was fielding calls from Durant’s inner circle trying to call a truce. This one may have died down for a day or so, but it seems like the temperature is still rising. Durant is presumed by many the crown jewel of the free agent market. There will be many things that will be said about where he may or may not go all summer long. So why he was distracted by Smith saying what he had reportedly heard from sources? This was honestly something that never even should have struck a nerve with him. And calling Smith a liar through the media was uncalled for. It is understandable that he may not have liked what was said, but there will be many things that will be said over his lifetime that he will not like. In a sense, Smith calling players these days sensitive was a great assessment when it comes to Durant. If he wanted to respond to Smith, take that conversation behind closed doors. I’m sure Durant has Smith’s number and has contacted him more than he is letting on. Questioning someone’s credibility is not the answer here. But it seems like Durant has been going a different road over the last year with the media. It started with his talk in regards to how the media does not know much (which was followed by an apology) and it has apparently not left. Not sure what is going on with Durant, but his laser focus needs to stay on the court and not in the media. Stephen A. Smith, for his part, did some things in this one that were not the brightest. He was called out as a liar by Kevin Durant and he just snapped. Smith would go on to call Durant a liar, tell Durant “he did not want to go there with him” and proceed to go through the whole situation. Although entertaining, this something that he could have done off air. Of course Durant took the dig at him and his credibility as a journalist and reporter. And anyone who is a journalist understands the fight for credibility that happens. That strikes a reporter and journalist to the core. But he could have been the bigger man, since he is older than Durant, and taken this one off the grid. Smith went off and that’s what fed into what some people loathe about him. But don’t let the persona he has fool you. Even though he is probably is not as involved in reporting and journalism as he once was, he still is a very credible source that has broken big stories before. Who remembers the person that broke the LeBron story of him going to Miami? That was one Stephen A. Smith. And there were many more stories that he has broken. So why would he lie on Kevin Durant just for this scoop? There would be no purpose for him to do so. And what a lot of people also missed is the truth that he laid in the rant. If there was not some truth to what was said, why would Durant suddenly react to him the way he did when others have floated rumors out there? All in all, both are grown men and they could have handled this better. But since they did not, they both taught us a few things in the process. Many have shot down Stephen A. Smith in this situation just because he was the one behind some of these comments. But if another commentator said what he said, then many would not have batted an eye at it. And in Durant’s case, if this was LeBron saying what he said, he would be getting killed in the media. Both these last statements are not just situations but they are facts. Looking past someone to actually listen to what they are saying is something that we have lost in this world. Disdain for someone is understandable, but don’t let that blind you to what is being said. And that in itself is a lesson many could learn. But in the end, both these two need to get off social media and the television and pick up the phone. I’m sure in the end, both of them still have love for each other. There are many free agents out there that have some decisions to make. Some, like Marc Gasol of the Memphis Grizzlies, are only taking meetings with the team he has played for in the NBA and no one else. While others have decided to open up the field and take meetings from everyone. There are some enticing names out there, but one that rings a bell for many is Portland Trailblazers forward LaMarcus Aldridge. Last offseason, the Portland Trailblazers tried to lock up the talented forward to an extension. And although it was believed by many that he would stay there and sign a more lucrative extension with Portland this offseason, there was some speculation as to him potentially leaving Portland this summer. This belief came to fruition a little bit more when Aldridge opened up his recruitment this summer as of the last few weeks. There are as many as seven teams that are reportedly interested in him and want to add him to their rosters. Aldridge, although he has not really won a lot in the playoffs, is a big man that many consider dominant and that can change a team’s fortunes just with a signature. And expectedly, he is the most coveted free agent out there (subtracting LeBron James from this one because we know he isn’t leaving Cleveland again). But where would be the best fit for him? The list of teams interested in Aldridge are the New York Knicks, the Toronto Raptors, the Los Angeles Lakers, the Dallas Mavericks, the Houston Rockets, the San Antonio Spurs and the Phoenix Suns. Looking that list of teams, there are a couple that stand out in regards to his talents. If you have taken a look at Aldridge’s game, it is very versatile in terms of his range. The 6’11” power forward can post very well when he wants to. He can face you up and take the jump shot as well as drive the middle of the lane or the baseline to attack the rim. But what makes Aldridge even more special is his ability to stretch the defense for a man his size. He can shoot all the way out to the three-point line and he can also be a good pick-and-pop big with as well as he shoots the jumper. At times he can get too comfortable shooting the jump shot, but he is effective with it nonetheless. The team that would obviously benefit from having him the most is the San Antonio Spurs. Tim Duncan is not getting any younger and with Kawhi Leonard getting ready to accept a big extension from the Spurs, San Antonio needs another piece to go along with him. By adding Aldridge, that helps stabilize the team down low once Duncan decides to hang it up. In essence, you would be replacing Duncan with a player that is very similar to him but more athletic. Add him to what they have coming back next year reportedly (Duncan and Manu Ginobli are reportedly coming back on cheaper salaries to help the team) and this team could be hoisting the trophy again in 2016 with Aldridge. And the good thing about the Spurs is that they can pay Aldridge as much as they want due to the sacrifices of Duncan and Ginobli. At this point in their careers, they know they are playing more for rings than salaries. And for Duncan, that can help them potentially get one more before riding off into the sunset. For Aldridge, it would help him add a crowning achievement to his career and also help the Spurs bridge the gap successfully into the next era of San Antonio basketball. Imagine the motion offense they run with Aldridge and Kawhi being the main options. But for the here and now, Aldridge and Duncan would remind many of the original Twin Towers that San Antonio had when they won it the first time with a young Tim Duncan and a veteran David Robinson. Amazing how things can change over time as Duncan would be the veteran in this scenario. 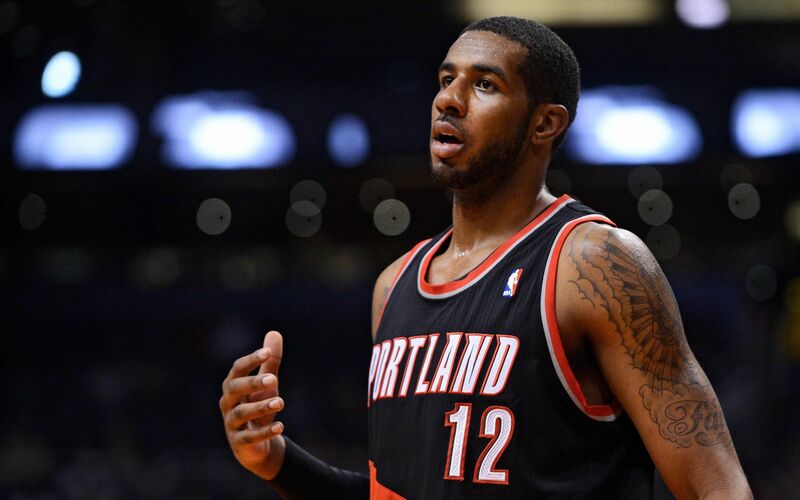 The Spurs would be an excellent fit for Aldridge and he could very well land there. But like there is a best fit for Aldridge, there is one fit that would be the worst for him. The Houston Rockets and Dallas Mavericks are clamoring for the services of Aldridge. Both are looking at him as the missing piece to what they want to accomplish. But in reality, both teams are a tie for the worst fit for his services. In Dallas, the team there is a jump-shooting team for the most part. And even though Aldridge can shoot the jump shot, he would basically be asked to be the post presence for that team. That is fine and dandy on the offensive end of the court, but on the defensive end that would be trouble. Imagine Aldridge having to be the rim protector for the Mavericks. Even though Chandler is older, he is still far and away a better rim protector than Aldridge will ever be. The only way the addition of Aldridge could work is if the Mavericks can send Dirk to the bench and allow Aldridge to start with a guy like Chandler as the center alongside him. But the reality of that happening is slim to none and even if it did, the Mavericks still would not have enough in the West to win a title. As far as Houston, they seemed to be run by James Harden. And that can be a good thing and a bad thing. Harden is a playmaker on the offensive end of the court and a lot of the offense runs through his hands. But Harden has said that he would like for Houston to bring another playmaker in besides him next season. Looking at the Houston Rockets as they are (when healthy), there are devoid of another playmaker and need one sorely to take the load off Harden a little bit more. In the draft, they had the opportunity to add a playmaker and chose to add Sam Dekker instead. So with the addition of Aldridge, that would not address the need they had. Dwight Howard occupies the post and that would take away from the touches Aldridge would have in there. And as far as him pairing with Harden, he would become exclusively a pick-and-pop guy, and that would not be what the Rockets needed. Ironically, Josh Smith actually fits this team better than Aldridge because he has the ability to be a playmaker, although he is inconsistent at times. Aldridge going there would not make this team any more dangerous unless they got rid of Dwight Howard or he found a jumpshot, two things that are not likely to happen anytime soon. Of course there are four other teams that fit in this scenario and the Lakers are reportedly the leading candidate for his services. The fit there would be nice, but with the fluidity of the situation there in regards to the potential trade for Sacramento’s DeMarcus Cousins, there is no telling what kind of team will be there. If they get Cousins, the team would be tough provided Kobe can stay healthy this season. If they don’t trade for Cousins, then he could potentially have to play center and that would not be a good thing defensively at all. In the end, Aldridge will get paid one way or the other. The decision is his ultimately, but if he is seriously thinking about getting a ring along with getting paid, San Antonio is the spot where he needs to go. They have the best coach, system and scenario for him to succeed immediately. For more sports talk, follow me on Twitter or check me out on Facebook. Decision time has come about for many in the NBA. There are some players that are have options on their contracts whether they would like to accept the contract they have or opt out in search of a better deal for themselves. LeBron James is one of the names that is opting out, but he is expected to re-sign with the Cleveland Cavaliers. But James isn’t the only star player that has this option in Cleveland. 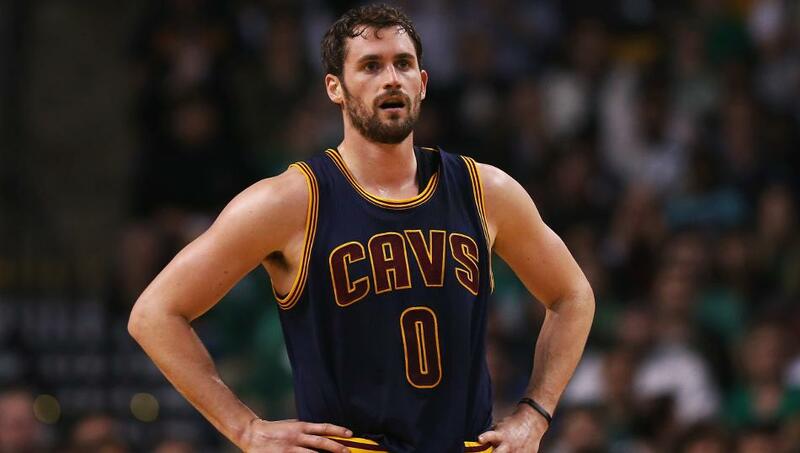 The Cleveland Cavaliers traded for Kevin Love last offseason and shipped the past two number one overall picks to Minnesota for him. The Cavs did this knowing that Love could potentially opt out of his deal after this season. But to many, they believed that Kevin Love and LeBron would be a good pairing based on their games. Well, it seems as if the pairing did not work as well as some thought, as Love had one of his worst scoring and rebounding seasons in the NBA. The pairing of Love with Kyrie Irving and LeBron James was not as good as some thought it would be. And as the season went on, it seemed the relationship between both James and Love was not the smoothest either. Of course Love is one of the hardest people to read in the NBA, so this talk about their relationship could be just rumors. But with all that talk and the play circulating in the media, Kevin Love made a decision to opt out of the last year of his contract with the Cleveland Cavaliers. He could still end up in Cleveland next season, but the great thing for the Cleveland Cavaliers in this decision is now it makes it a little easier on them as to what options they have this summer. If Love would have opted in, the Cavs would have been in a tough place when it came to Tristian Thompson, who is a restricted free agent this offseason. Now instead of wondering how Love and James would get along, the NBA and its fans will be waiting to see where Love turns up next. Kevin Love is a stats guy. He has averaged double-figure points and rebounds for five of his seven seasons in the NBA. And for what it’s worth, he is one of the best outlet passers in the NBA. That could be great for a team that is starting the fast break. The perfect fit for Love would be a team that has some explosive wings but allows him to be a focal point of the offense. In that aspect, there are a few teams that may be able to comply with what he would like. The most obvious answer for a team craving Love is the Los Angeles Lakers. Many Lakers fans have thought that eventually Love would be coming home to the Lakers. And in this circumstance, he could make Los Angeles his home. The Lakers have at least $23 million in cap space this offseason. The Lakers recently selected D’Angelo Russell out of Ohio State with the 2nd pick in the draft, so the indication from Los Angeles is that Love will be one of two power forwards they look at this offseason (LaMarcus Aldridge is the other). But with the silence of Kevin Love, you don’t know whether or not he wants the extra year on his deal and that could potentially affect him coming to LA or not. The only way he gets that extra year on his deal to go to Los Angeles is if he is signed and traded to them. And in that case, the Lakers would have to give up something to get him. More than likely it would be future draft picks and also a player. If I was the Cavaliers, I would ask for Julius Randle in return for trading Love to the Lakers. That would allow for the Cavs to sign Tristian Thompson back and also get him a backup in Randle to solve their power forward position. But of course, the Lakers are not the only ones interested in Love this offseason and they may not even be interested in parting ways with Randle so soon. The Boston Celtics are another team that is checking out the prospects of bringing Love in. Danny Ainge tried to work something out to get him to Boston before when Rajon Rondo was still their point guard to no avail. Well, the Celtics now have a stockpile of picks and interesting players available to make something happen this time. The Celtics, like the Lakers, could try and swing a free agent deal with Love and leave it at that. That would give them Love’s talents for four years and more than likely max money. But if the Celtics were to decide to do a sign and trade for Love, they have all the assets to make it happen. They have a gluttony of talent in their frontcourt that many would be interested in including forward Jared Sullinger and forward Kelly Olynyk (wouldn’t it be interesting if he was traded to the Cavs in this one). But in all honesty, Love would not make as big a difference as the main player on that team. The Celtics need one more piece to go along with Love should they sign him outright or trade for him. That piece is a frontline scorer. If Love is brought in on that team and asked to be the leading scorer for them, then that team would go nowhere fast. And with the picks the Celtics made in this most recent draft, you have to count on free agency for them to add some punch there. In the end, he is not a difference-maker for that team that takes them to the playoffs. Of course he would get more touches and make more things happen for that team. But it would be Minnesota all over again but on the East coast and Love wants to be the focus or secondary focus on a team and win basketball games. A darkhorse candidate that may take a look at Love is the New York Knicks. They drafted big man Kristaps Porzingis 4th overall in the draft, who by all accounts will not be ready to make a big contribution anytime soon. The Knicks redeemed themselves a little bit with trading Tim Hardaway Jr to the Atlanta Hawks for talented point guard Jerian Grant, but there is still the matter of that hole in the frontcourt. As the Knicks stand right now, they have no big men that are going to be there. Carmelo would slide back to the power forward position again if no one is found, but that is not expected to happen. The Knicks are expected to make a run at big man Greg Monroe and there are rumors out there that David West could sign there after opting out of his player option in Indianapolis. But none of these guys is a given to sign at this point and time. And even if the Knicks were going to sign Monroe they would still be able to take Kevin Love. Of course the money dries up quick when you spend it, and the Knicks would overspend for Monroe and another piece as well as trying to get Love. If that is the case, he would be looking to play elsewhere as he is not the top priority there in New York. Plus there is also the issue of whether he and Carmelo could co-exist, which no one knows. Melo is different from LeBron in that he is more of a scorer than facilitator. And that mix may not be something that would fit Love’s game, let alone the bright lights of the city that he seems to not care for. We could speak of them trading something to Cleveland, but the Knicks have nothing to offer there due to trades in the past and their roster not being as talented. Love is going to be sought after by a few teams this offseason and there may be some surprises out there that were not mentioned. But along with potentially re-signing in Cleveland (which is a longshot at best at this point), Love has some things to think about. After all, this contract could be the last big contract he signs in the NBA. In all honesty, all teams would need to take a look at what they are willing to sacrifice for a guy that is a defensive liability but can flatout fill it up on the offensive end along with battle on the offensive boards. The choice is not only his but the teams that are interested. And come July 1st, Love, like many others who opted out of deals, will be deciding whether the grass is greener on the other side of the fence. If you like sports talk, feel free to follow me on Twitter or check me out on Facebook. The NBA Draft will be upon us very soon. And there will be a lot of young men that will becoming instant millionaires. But where will they go and who will be taking them? Many have taken stabs at trying to predict it, so here at the The Everyday Man’s Sports Blog, I have decided to take our stab at it and explain as to why some teams will be taking some players. Here are the first 15 picks of my mock draft and why. Disclaimer: This will not include trades of picks or anything like that. The predictions of picks will be for the team that has that pick at that certain time. Well, let’s get started! The Minnesota Timberwolves already have the reigning Rookie of the Year, Andrew Wiggins, to build around and now they have the 1st overall pick. With the team they currently have, they are more of a speed team. With players like Zach Levine and Wiggins filling the wings and point guard Ricky Rubio dishing assists, it would actually make more sense for them to select Towns to run with this team. But again, the Timberwolves do need someone they can throw the ball to in the post and get a basket. And with that notion, they may not want to wait and see what Towns becomes at the NBA level. So with the affinity that Timberwolves coach/general manager Flip Saunders has for Okafor, it is almost a no-brainer that he gets selected there. When the game slows down, the Timberwolves are hoping Okafor can be the guy to sustain their offense with his offensive footwork and soft touch. Of course the Timberwolves may suffer defensively with the young big man, but they will take their lumps there if the big man is able to produce for them. One of the coveted big men in this draft is headed to the Los Angeles Lakers. Assuming Flip Saunders is still in love with Okafor, the second most-coveted big man is headed West. The Lakers are looking for yet another piece to help them in their rebuild. They selected power forward Julius Randle last season out of Kentucky and he was essentially hurt all year after he suffered a season-ending injury in the first game of the season. But even though they lost their top rookie, the Lakers still got great play from second-round pick Jordan Clarkson out of Missouri. Now with Randle coming back next season, the Lakers can add a healthy but aged Kobe Bryant and versatile big man in Towns. The big man out of Kentucky will add rebounding, shot-blocking and versatility to the Lakers frontcourt and he will also be able to learn the Laker way under Kobe for what some think is Kobe’s last year in the NBA. Look for the Lakers to begin the rebuild with Towns, Randle and Clarkson and maybe another piece in free agency to add with Kobe Bryant. It may take a little time for Towns to show his skills. But once Towns settles in, the Lakers will be happy with the monster they end up drafting. The Philadelphia 76ers had a chance to get multiple picks in the lottery. But with the way the ping pong balls dropped, they ended up with only one. However, the 76ers still ended up in great position with the 3rd overall pick. The last couple of years, the 76ers selected injured players and essentially redshirted them for their first season in the NBA. Well, this season will be something different. The 76ers have some nice complimentary pieces that would fit well on a team that had a star. But the team is void of star power currently as they stand. Nerlens Noel is a player the team is high on, but they also have a decision to make with how they can use he and Joel Embiid. They may try Noel at the power forward position, but they will be physical and rugged up front. The problem with this team is they do not have a point guard. Well, in this draft, they have their choice of which point guard they want. Some may want the services of D’Angelo Russell here, but the 76ers may have others ideas. 76ers general manager Sam Hinkie was the only general manager to fly to China to see Mudiay and that should tell you right there the way he is leaning. The 6’5” point guard, who many don’t know a ton about, will be the 76ers international man of mystery this year and he will be one that will have Philly fans excited because of his size, speed and athletic ability. The Knicks are going to have a lot of cap space this summer and plenty of Knicks fans were hoping the number one pick would be joining the players the Knicks are able to obtain with the money available in free agency. Well, everything did not pan out as well as the Knicks and their fans had planned. But all hope is not lost. Things could have been worse for them and they could have landed even further back. They will more than likely not get one of the coveted big men in this draft and that could have been something that would have helped Carmelo Anthony when he returns next season. But another thing they didn’t have last season was solid point guard play. The Knicks need a player that can be special with the basketball and bring some sizzle to the Garden. Russell is as talented an offensive player as there is in the draft. He has a nice stroke, good handles and can make the perfect pass in a tough situation and he is no slouch defensively either. He and Carmelo together and maybe a big man in free agency could be an interesting dynamic together. And the Knicks will finally have a point guard that could compete with the top point guards in the NBA potentially in a point guard driven NBA. The Orlando Magic have been out of the spotlight since they traded away Dwight Howard. The team has not been close to being a playoff-caliber squad and that is quite bad considering they play in the Eastern Conference. But this team does have some young pieces they can build with. Victor Oladipo is starting to catch his stride in the NBA, starting point guard Elfrid Payton got better as the season went on and Nikola Vujevic was a machine inside. The Magic fired their head coach, Jacque Vaughn, during the season and hired former Magic player Scott Skiles to man the ship. With Skiles, the Magic will have a demanding head coach that will want to execute and play hard. And what better piece would fit his scheme than Kentucky Willie Cauley-Stein? The athletic big man from Kentucky will remind some of current Chicago Bulls center Joakim Noah with his game. He is not a scorer, but he is a guy that will defend, block shots, rebound on both ends of the floor, give you putbacks and play hard at all times. The passing is not the level of Noah, but he can have a great effect on a team that is trying to form an identity. The Latvian big man joins a long line of European players that have tickled the fancy of many scouts and executives. Many of those that have observed the 7’1” big man have been wowed by the things that this kid are capable of. He can shoot the midrange shot and can put the ball on the floor. And he is also not too bad an athlete. For the Kings, they would love to have a guy like this join their team. George Karl is still missing a power forward that would complement starting center DeMarcus Cousins, but this guy could be the guy. With many comparing his skills to that of Dirk Nowitzki, he would be able to space the floor for Boogie to operate in the paint. Porzingis, for all his talent, is one that could take time to develop though. He is still pretty young (19) and the step to the NBA could be one that proves difficult for him at first. But the Kings have a history of taking guys like Peja Stojakovic and Hedo Turkoglu, so naturally he would be a choice for them. Look for Karl and company to take him with their selection. Winslow was the less-heralded member of Duke’s big three recruits last season (Tyus Jones and Jahlil Okafor). But over time, he became the most important member of the trio. Winslow played well down the stretch and helped lead the Duke Blue Devils to the National Championship. Not a bad way for a freshman to start and end his college career. Winslow is an intriguing prospect for many. He is a very solid defender and can be special offensively, especially on the fast break. With the team the way it is in Denver, they will probably be more uptempo. And with the skills of Winslow, he would fit in perfectly with what they would like to do. He and Ty Lawson would be a perfect fit beside each other or he could slide to the small forward position at times even though he is not the ideal height for the position (slightly under 6’6”). Imagine the type of energy Winslow and Faried could create on the court should they become teammates. Wow. The Pistons will more than likely keep Reggie Jackson as their point guard and match him alongside Caldwell-Pope as their guard tandem. And even if they lose starting big man Greg Monroe, Detroit still will have the talents of Andre Drummond to sustain them. And even though he is limited in the post, Jackson could get him easier shots when he gets in the paint and distributes. But the biggest hole this team has had is the small forward position. They have not been solid there for a while and that includes two tours of service from their best small forward in over a decade, Tayshaun Prince. Adding Hezonja would bring some athleticism to that position along with someone that can shoot the basketball. He could slide into the starting lineup as the small forward eventually for the team should they sign a veteran to get the nod on the starting spot. But if he is drafted by the Pistons, he would be a welcomed addition and likely groomed as their small forward of the future. The only thing the Pistons would have to worry about is how his defense will hold up. And that could be the main reason he does not start immediately in Detroit for Stan Van Gundy. The Charlotte Bobcats are a team that struggled to score all season long. Al Jefferson was just not the same as he was the year before and Kemba Walker was not the same either due to injuries. They brought Lance Stephenson in for added scoring punch, but that move has proven to be a failure at this point. So in a move to get more offense, the Bobcats could bring in Stanley Johnson. The young guard/forward out of Arizona had some troubles shooting in college at times, but he can attack the rim and be a playmaker as well. With his addition and his acclimation to the professional game, he can definitely be a good addition to this team. And with his addition, it should be interesting to see what they do with Lance Stephenson, whether it be bring Stephenson in off the bench, start Stephenson or trade him before the season starts. Booker was one of the overlooked players on the loaded Kentucky basketball team last season. But there is no mistake that he was their best shooter. And when he got cooking, it was trouble for everyone. The Miami Heat are staring the potential end of the Dwyane Wade era whether it be this offseason if he indeed opts out of his contract and leaves or down the line when his body cannot hold up anymore. Whether he comes back or not, Booker would add a young guard that can make some things happen with the jump shot. Miami does not really have anyone on the perimeter that would be as consistent a shooter as he can be. And the great thing about him and potentially being a Wade replacement is he is not just a stationary shooter. Booker’s game off the dribble is underrated and many did not get to see it much due to the team he played with. But Booker can maneuver with the basketball (even though he does need a little bit more work with his handles). And the best thing that he can do is shoot the midrange jumper. That shot could be dangerous if he improves his handles. Booker would fit in whether being off the bench and would spread the floor for Bosh as well. The Indiana Pacers were playing without their star, Paul George, all season long. You would have thought that would have meant they would focus the offense more on center Roy Hibbert. But unfortunately, he was not able to come through like they have paid him to do and they struggled to get it done as a team without George. Some would think they would go point guard and select Cameron Payne out of Murray State, but they need someone that can get them some buckets and some production out of the center position. Kaminsky fits the bill for what they need. He needs to get stronger, but he can post and can also step outside and shoot. The Pacers offense would be better with the addition of him and with Hibbert going into the later stages of his contract, he could end up sliding right in as the starter eventually. The Utah Jazz finished the second half of the season strong after starting off slowly. The team had some issues with chemistry in regards to forward/center Enes Kanter, but when they traded him they seemed to play better. Derrick Favors and fellow big man Rudy Gobert fit better together as a duo than Kanter and Favors. But what that team is missing is another big man to fit in their rotation that brings something different than Favors asnd Gobert. Both players are athletic and can finish at the rim, but neither can shoot with any kind of range. With Myles Turner, the Jazz get a guy that can stretch the defense with his shooting ability and could cause some problems with his size as well. He would give them some pop off the bench as well. And with his addition, the Jazz would be able to continue their rebuilding process towards contention again. The Phoenix Suns were definitely a team that a lot was expected of last season. But with the team did not live up to expectations and did not make the playoffs. The results are a team that some are down on at this time. The Suns are known for pushing the tempo and guard Eric Bledsoe will be entrusted to do so going forward. But when you look at production in the post, the Suns really don’t have that one guy that can get you a bucket in the paint. With Bobby Portis, that issue is taken care of. Portis can post in the paint as well as can shoot the midrange jump shot. His addition would allow for the Suns to have a more fluid offense that can do everything. Love the Morris twins, but they cannot be depended on to score in the post at all despite their solid perimeter skills. The Oklahoma City Thunder just could not stay healthy last season. And even though they had struggles there, they still almost made the playoffs. Despite that, this team is still looking for some additional parts to add to their arsenal. Looking at what is out there, they have some athletic wings that can make it happen. But they are missing that one lockdown perimeter defender that can take them to the next level. Although Oubre will not be the starter there in Oklahoma City over Kevin Durant, he could be that guy. Andre Robertson is nice, but he does not have the overall ceiling that Oubre does and the length advantage also goes to Oubre as well. With his addition, he will help make the Thunder a deep team under new head coach Billy Donovan. And although his offense may be sporadic at the beginning, he will definitely add to the athleticism they have and his versatility defensively will be a thing of beauty to watch. The Atlanta Hawks were definitely better than many expected, as they played their way into the first seed in the NBA’s Eastern Conference. And despite lacking a superstar, they made it all the way to the Eastern Conference Finals, where they lost to the Cleveland Cavaliers. Free agency may not be kind to them this offseason as both their starting forwards, DeMarre Carroll and Paul Milsap, are free agents. With that in mind, the Hawks may be able to keep one but not the other. Assuming they are able to keep Milsap there in the ATL, the Hawks will be looking to add another small forward to their team. The best possible fit for them at that position is Dekker from Wisconsin. He has good size, athleticism and can shoot the basketball. And most importantly, he is able to defend at the next level. He should fit right in with what Atlanta likes to do and be an additional cog in their already talented and deep team. Dwyane Wade has been a staple of Miami Heat basketball ever since he was drafted there back in 2003. Back when he was selected 5th overall in the infamous 2003 draft, some thought he wondered how good he would be. Well, a few years later, he has churned out a Hall Of Fame career and is closing in on retirement with each passing day. He has also been able to do something that many have not been able to do in their careers: stay in one place. Through the years, he has been very visible on the court for the Heat along with part of their community. The dynamic shooting guard has also been very unselfish as well, taking less money to help the team over the last five seasons. And to his credit, the team was able to bring in superstar forward LeBron James and perennial All-Star Chris Bosh to help make the team better. The results were four NBA Finals appearances in the first four years and two more NBA championships for Wade, adding to the title he won with Shaquille O’Neal in Miami in 2006. But after the fourth year and a disappointing loss to the San Antonio Spurs in the NBA Finals, Wade, James and Bosh all decided to opt out of their current deals for new ones. In the summer of 2014, Wade agreed to a new deal worth $31.1 million over two years with a player option for the second year. Being that Wade had two years and $42 million left on his deal, Wade took a $5 million per year paycut to stay in Miami. And although LeBron James decided to go back home to Cleveland after four years in Miami, the Heat still had money to re-sign Chris Bosh to a max deal (5 years and $118 million) and LeBron James’ replacement, Luol Deng (2 years and $20 million with a player option for the second season). Unfortunately, taking less money did not work out for him or the team this time. Wade and the Heat missed the playoffs and were not as successful as some thought they would be. Of course, the absence of Bosh due to blood clots in his lungs for the second half of the season was a costly injury to their success, but the Heat were still fighting uphill to make the playoffs with him. During the season, the Heat traded for point guard Goran Dragic even though he was expected to be a free agent this offseason. And many though that he would be the one person to watch with this team this summer. Would they sign him or would he take a deal form another team? Well, all that talk about Dragic has been silenced by one Dwyane Tyrone Wade, Jr. 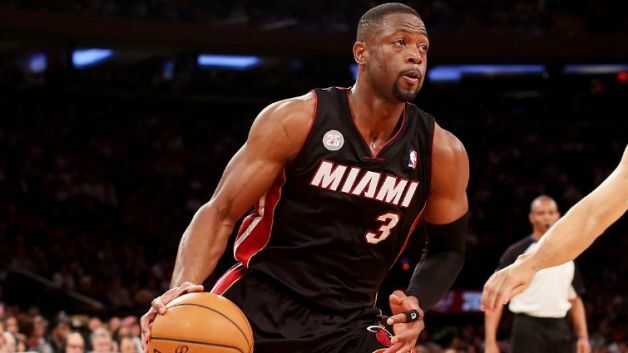 Recently, word began to matriculate out that Wade may opt out of his current deal with the Miami Heat. There are rumors out there that he wants to get paid more money in a longer-term deal. Well, apparently the Heat do not have the same feelings and in some circles, there are people that think the threat of Wade leaving Miami is real. Honestly, this would be something that many would not have seen coming. It was thought that he would retire a member of the Miami Heat and potentially land a job with the team in the front office. But this isn’t about loyalty this time. This is about business. Wade is 33 years old now. He is a veteran that knows time is limited in the NBA. Whether he values more money, winning or both are things that have yet to be answered by him at this point in his career, but it can be assumed he would like to win and get paid more at the same time. So, the question now falls on the Miami Heat and what they are willing to do. Do they pay him more money or do they let him walk? On one hand, they cannot let him walk. Like mentioned earlier, he is the face of Miami basketball and has made many sacrifices for the team over the years. The Heat could take a public relations hit if they let Wade walk considering all he has done. And if he walks, Dragic could potentially leave with him. That would leave the Heat with Chris Bosh and a bunch of players that are not prepared to step up in Wade and Dragic’s absence. And at that point, the Heat would probably either get players one-year deals in hopes of attracting Kevin Durant in the 2016 free agency class or they could take their shots at some free agents out there on the market this offseason. Either way, there is some decisions that Miami has to make and this season, they all hinge on the decision of Dwyane Wade and not LeBron James as it did last summer. If Wade is to opt out and seriously go somewhere else, where would he go and get the money he wants? There are only a select few teams that have the deep pockets to pay him what he wants. One team that does have money to spend are the Los Angeles Lakers. But the thing that would hinder him going there would be one Kobe Bean Bryant. Wade and Bryant both play the same position and both are getting up there in age in their careers. This would be the most unlikely of scenarios for the Lakers and something that isn’t what they would want to begin with. The other team that has cap space this summer would be the New York Knicks. Of course that would mean he would leave to go play with Carmelo Anthony in New York. That combination and the Triangle offense would not necessarily be a good fit at all either. Melo is a scorer and needs the ball in his hands. Wade has gotten better playing off the ball, but that pairing would be mean that the Knicks are giving up on Tim Hardaway Jr. and that they are not going to take that money and sign a point guard and big man they need more than another shooting guard. There are surely other teams out there, but these two can offer Wade the most money to finish off his career. And for those that are thinking it already, there is little to no chance that the Cavaliers can bring Wade to Cleveland, pairing him with one of his best friends, LeBron James. The team is already over the cap for this season and they have their own decision to wait on from Kevin Love amongst other things to figure out in their offseason. And there is also the chance that LeBron James could opt out of his deal as well, making him a free agent again. The situation with James is unlikely being that the cap goes up in the summer of 2016 and that would position him to be paid in the neighborhood of $30 million per season, but there were many that thought he would never leave Cleveland in the summer of 2010 and that happened. Many things are on the table for Wade at this time, but thinking that he will get more money from another team this summer is something that is not very realistic when looking at the entire picture. The battle between Wade and the Miami Heat has begun. One wants more and the other wants to keep building towards contention. In this battle of the face of the team versus the team, it should be interesting to see who comes out on top. But be for sure Dwyane Wade saw the contract extension Kobe signed with the Lakers for two years and $48.5 million. He envisions himself as second to Kobe at the shooting guard position, so we can guess he feels he should get something near that amount of money. Which side blinks first on this one will be something to watch going forward. 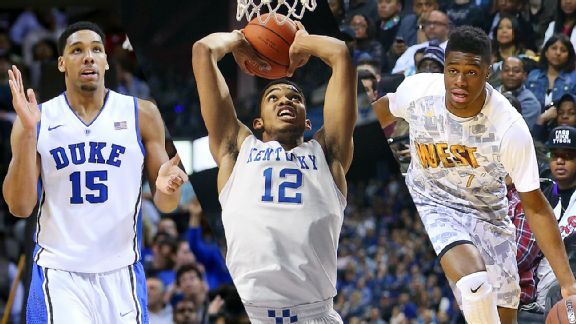 Tomorrow’s superstars could potentially be in the 2015 NBA Draft. Many are excited over the many talents that are out there including the teams. But before anyone can pick, the NBA had their usual routine during the Conference Finals, the NBA Draft Lottery. In the lottery, the order in which teams pick is determined by their record and the bounce of a ping pong ball. The more you lost during the year, the more ping pong balls you had available to obtain the 1st overall pick. There were many teams that were hoping to obtain the 1st pick, but in the end, the Minnesota Timberwolves ended up with the number one spot. They were followed by the Los Angeles Lakers and then the Philadelphia 76ers. The top five was completed by the New York Knicks and the Orlando Magic. With that being set, many are starting to envision who will be wearing their favorite team’s jersey. Well, let’s take a second and check to see who could be landing where! 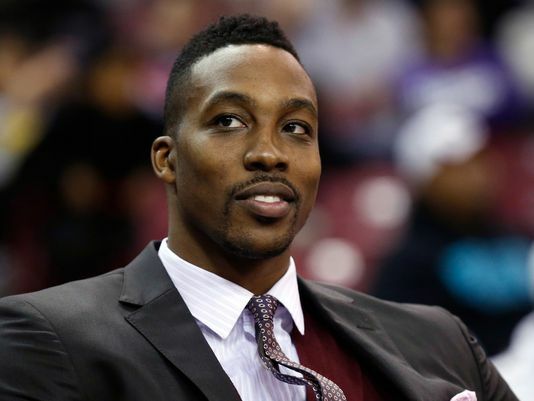 The Orlando Magic have been out of the spotlight since they traded away Dwight Howard. The team has not been close to being a playoff-caliber squad and that is quite bad considering they play in the Eastern Conference. But this team does have some young pieces they can build with. Victor Oladipo is starting to catch his stride in the NBA, starting point guard Elfrid Payton got better as the season went on and Nikola Vujevic was a machine inside. The Magic fired their head coach, Jacque Vaughn, during the season and reports are that they are looking at current Chicago head coach Tom Thibodeau and are willing to do anything to get him there. If that happens, you can bet he will look to build his team identity through defense. And what better piece would fit his scheme than Kentucky Willie Cauley-Stein? The athletic big man from Kentucky will remind some of current Chicago Bulls center Joakim Noah with his game. He is not a scorer, but he is a guy that will defend, block shots, rebound on both ends of the floor and give you putbacks. The passing is not the level of Noah, but he can have a great effect on a team that is trying to form an identity. This NBA Draft could help a lot of teams, but these in the Top 5 need it the most. And if they draft correctly, these guys could make their teams better immediately if they are selected where they are. It should be interesting to see if these selections hold true to form or if trades happen to change up the selection. 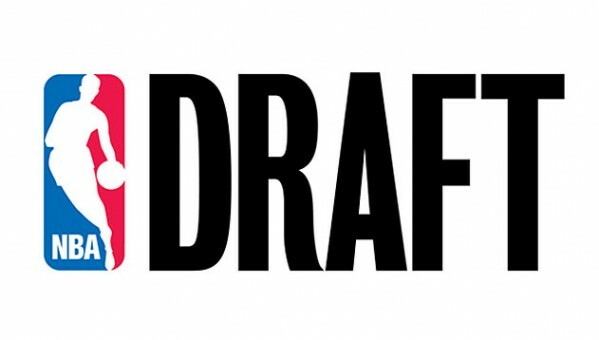 What are your thoughts on The Everyday Man’s Sports Blog’s Top 5 NBA Draft Projections?